Researchers at the Indiana University School of Medicine are responsible for a new study that is one of the most alarming drug side effect studies to be released in years. They published it in the journal JAMA Neurology. Specific types of drugs cause your brain to shrink and your ability to think and draw conclusions to seriously diminish. What’s even scarier is that these drugs are some of the most commonly prescribed medications for people over 60. And used for both mild and serious health issues. Therefore, it’s more likely than not that you’re either taking these types of drugs or will be pushed to take them soon. Their participants were 451 people in their early 70s, of whom 60 were taking anticholinergic drugs. The other 391 were medication-free. After structural magnetic resonance imaging (SMRI) scans, cognitive functioning, and memory tests repeated several times over at least two years, the scientists could clearly see that the brains of those on the anticholinergic medications were smaller than those of the non-drug takers. The atrophy was not limited either; it was spread all over. Drug takers had smaller cerebral cortices on both the left and right cerebral hemispheres. This basically means the outer layer of the neural tissue across their entire brains! In addition, their lateral ventricles were larger than those of non-drug takers were. Many previous studies, such as one in a 2012 edition of the journal Alzheimer Disease & Associated Disorders, have confirmed that lateral ventricles enlarge as dementia and Alzheimer’s disease advance. Consequently, together with the structural changes in their brains, the cognitive functioning tests were also depressing. They scored lower than non-drug takers on memory and recall, on executive decision-making and control, and on logical associations. These are pretty major disabilities that are worth preventing by avoiding the anticholinergic drugs that give rise to them. 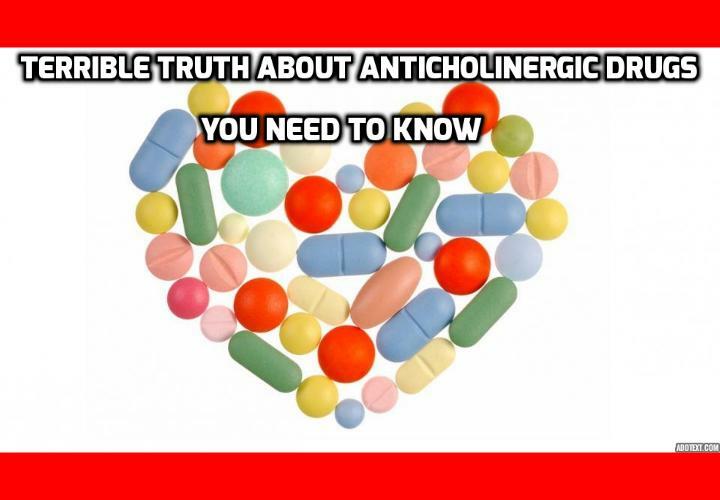 So what are anticholinergic drugs? They are medications that block the neurotransmitter acetylcholine throughout your nervous system. The only problem is that acetylcholine has a huge number of functions. • Parkinson’s disease, anxiety and depression (antipsychotics and tricyclic antidepressants). If these sound difficult to avoid, it is because they are. The researchers propose that people who enter the senior years try to avoid them almost completely, as they are at greatest risk of brain atrophy. This is not the first time scientists have raised the alarm over these medications. JAMA Internal Medicine published an article in 2009 that described a study on 4,128 women and 2,784 men aged 65 and older. It also concluded that anticholinergics lowered their verbal fluency, global cognitive functioning, visual memory, and executive function. What is the Best Way to Cure Vertigo and Prevent Stroke? What is the Best Way to Treat Vertigo Without Drugs? Vertigo Triggers – What is the best way to Cure Vertigo? Previous PostPrevious What is the Best Way to Treat Vertigo Naturally? Next PostNext What You Need to Know about Severe Vertigo?